Good job keeping an eye on her suitcases kitties, now she can't go away for too long. Lovely to see you two!!! Oh no, your mom is going somewhere. Is somebuddy going on a trip?? Hey, is Mom Paula going somewhere? I always think that pink is their color, but they look lovely on the blue too! I hope the trip is fun! 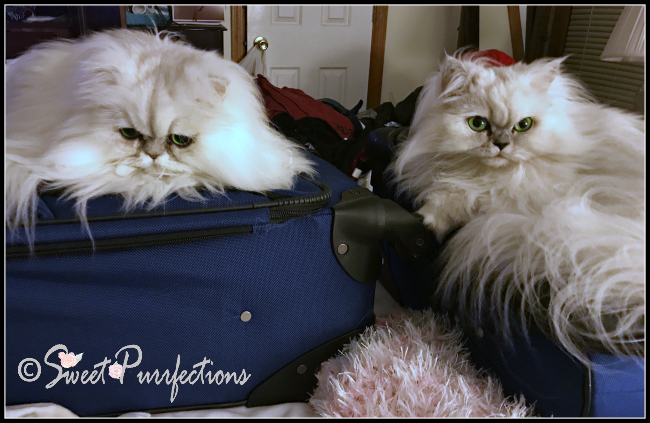 What are those suitcases doing out? Where is your mum going? !